It seems apparent that, like many of us, author Nicholas Nigro has seen his fair share of employment downtime. Lucky for us, his misfortune granted him the freedom to put together a journal for the unemployed. This is one of those books that comes off more like a blog for the unemployed, which is great (especially if you are unemployed) because it will allow you to skip over, ignore, or section the book however you please. All in all, No Job, No Prob could have easily been called “Chicken Soup for the Unemployed Soul”. There is plenty of advice on how to keep up your mood, what company to keep, and how to get the next great gig on your quest for the best job. Although I have never personally read any of the “Chicken Soup” books, I could see this one fitting right in to the series. No Job? No Prob! offers much more than a comfort for your bruised psyche, and can greatly benefit your personal finance habits, whether you currently hold a job or are on the prowl. A wealth of ideas await you within these pages. Whether you are looking for a new and interesting website to cure your boredom, start a new hobby, or further your education, it is all covered. Some you may know, many will be completely new to you. But Nicholas would not want you sitting on your duff the entire time you are looking for a new job! Staying active is an often-referenced theme throughout these pages, including walking, biking, hiking and hitting the gym. Keep in mind that this information is delivered in an entertaining way, with stories and anecdotes throughout. It’s not a freakin’ textbook! No Job? No Prob! covers nearly every conundrum or livelihood issue you could possibly face when employment alludes you. One area that answered some questions I had was the comprehensive section that covers unemployment insurance and how to collect it. If you are currently not receiving a paycheck and have your own questions about how to collect unemployment (or if you are even eligible), Nicholas will likely answer it. If he can not, you will definitely be steered in the right direction to resources that will be able to help. If you are worried about how to make enough to pay your bills, have no fear! There are plenty of ideas here to try out yourself that will help you get some much needed cash in your account. Again, some of these ideas you have no doubt heard before. Some may be completely new to you. Even though I live in the world of the employed, I really enjoyed this book, proving that you do not have to be unemployed to appreciate a book about unemployment. (It may actually make you glad you have a job). While this is far from a “must read”, it will benefit the unemployed more than those with a job. It is hard for me to tell you to to purchase a book if you are unemployed, so you can take advice directly from the author: Use the library or sit down in one of those moderately comfortable chairs at large bookstores and enjoy! 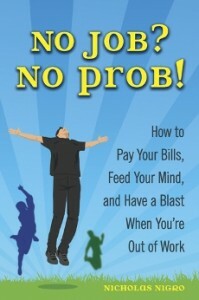 Entertaining, enlightening and motivational, No Job? No Prob! is a good read all around. Next post: People Pay for This? I Just Don’t Get It.